You are here: Home / Main / Want To Serve On Bridgeville’s Planning Commission? Want To Serve On Bridgeville’s Planning Commission? 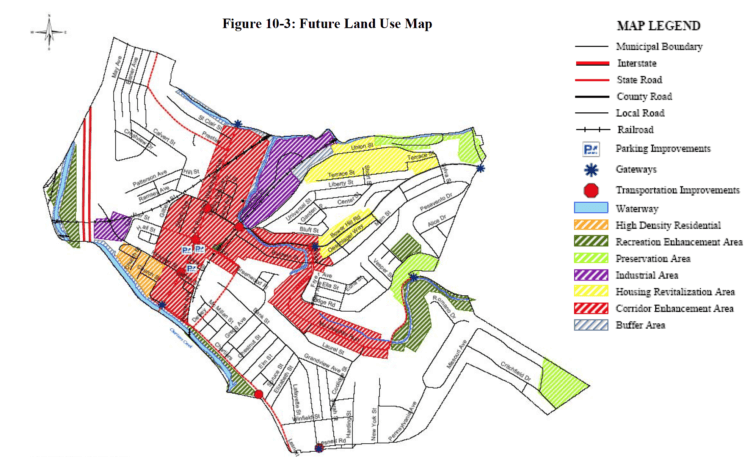 Bridgeville’s future land use map an envisioned in the 2005 comprehensive plan. When Bert Cherry was appointed to borough council last month, that created a vacancy on the Bridgeville Planning Commission. Now, the borough is looking for a resident to fill that empty seat planning commission seat. Deadline to apply is Aug. 4. The planning commission isn’t the most glamorous place to be a public official, but the commission could be hugely impactful in reshaping the borough. That’s especially true as neighboring communities are welcoming more townhouses, condos, and other high population-density housing, said Mayor Pat DeBlasio. The mayor suggested that an area like Baldwin Street could be an attractive spot for such redevelopment. “We have a comprehensive plan, but we need more narrow ideas, more focused ideas,” he said. The Borough of Bridgeville is seeking a candidate to fill a vacancy on the Bridgeville Planning Commission. The term will expire the first Monday in January 2019. All interested residents should forward a letter of interest to the attention of the Borough Manager, Bridgeville Borough 425 Bower Hill Road Bridgeville, PA 15017 prior to 4:00 p.m. Thursday August 4, 2016. Letters may be emailed to lcollins@bridgevilleboro.com.